for your successful website project. Do you want to achieve something from your website? Of course you do. Who want to throw money and time out of the window without any result? The REAL question is: How do you achieve your goals for your website project? The ONLY WAY to do a SUCCESSFUL WEBSITE PROJECT is to COMMIT YOUR RESOURCES to do it PROPERLY. At NILEAD, we are strong advocates for CONTENT WEBSITE APPROACH. We strongly believe that a website should be BUILT WITH PURPOSES. To help you discover everything you need for a HIGH CONVERSION WEBSITE, we have come up with a series of questions that will guide you through the DISCOVER, GOAL IDENTIFICATION, SOLUTION ANALYSIS, DESIGN, DEVELOPMENT processes. The list is long but WELL WORTH YOUR TIME, please ensure you can answer as many questions as possible, as detailed as possible. These questions are meant to get a quick overview of your business. We want to thoroughly understand who you are, what you do, how long you've been around, etc... These information will help support the research, design, development, and promotion decisions that we make throughout the entire project. We are a Digital Marketing agency, we provide full-suite digital solutions (web design & development, website management & support, online marketing & promotion). We have been on the business for over 7 years. We help businesses to run promote their brands, products, and services online effectively through the use of innovative technologies, high-conversion content and designs, smart integration with other third party services. 2. What do you want to achieve with the website (what are your goals)? And if your visitors don't want to take your secondary offer as well, then what would you like them to do? You should have NO MORE THAN 3 PRIMARY GOALS for your website, and secondary goals should go NO MORE THAN 3 LEVELS (including the primary goals). Secondary goals should be less demanding than the primary goals in term of commitment, and should allow you to eventually lead the visitors back to the primary goals. 3. How do you measure your success? The amount of new enquiries you get. Number of signups for the site's free trial. Please be very specific about what you want to measure, and these should be things that are quantifiable. 4. Do you have a website already? We want to know if this website project should be based on an existing website you already have. Our purpose is to learn from your past mistakes, likes and dislikes to deliver something that can outperform your previous version of the site. Which Content Management System does it use (if any)? How many inbound leads are you currently getting from it (monthly or weekly)? Are you happy with its current performance (goals wise)? Have you got any Analytics tool setup? If so, can you generate a report for us so we can see what's working and what's not? It's about 2 year old. Yup, it was easy to edit. We use the older version of Nilead Platform at the time. It was clean, straight forward. The whole design at the time was not consistent across the pages. There were not enough content. The site structure was was not well planned. We had about 2-4 weekly. No, not happy because its design did not reflect our brand plus we the conversion rate could be improved. Only Google Analytics at the time. Not much to carry over. 5. What is your Unique Selling Point(s)? The average Internet users visit at least 10 websites before making the decision (and sometimes much more than that, spanning over a period of time if the deal is relatively big). We want to know what make your business remarkable so that we can make sure to highlight the information on your website. Unlike some other Digital Agencies, we have our root in IT (so we actually develop all our tools and products instead of outsourcing). We build our own platform which we use ourselves so we actually build, test, and use the tools required to maximize our conversion online. We take care of all the hosting, maintenance, updates for our business owners so they can focus on their digital strategy instead of technical stuffs. We offer management service along with Continuous Website Improvement service that can actually help businesses to improve their online performance. 6. How does the website fit into your current sales process? If the website works as a single link in the sales chain then how does it integrate with the other links? 90% of our customers will come to the website first (directly or via Organic Search or Paid Search). We use our website to deliver various information to the client to support our sales process. We use the website to provide after sales services including but not limited to ticket support. Who are your direct competitors on the market (someone that offers the same products)? Who are your indirect competitors (someone that offers the same products but different goals/business models)? Who are your substitute competitors on the market (someone offers different products but serve the same purpose)? 8. Which websites do you like and why? We would like to get an overview of what you prefer to have on your website. Please be very specific about what you like on each website (i.e you may prefer 1 specific banner on a website, and some specific features such as Wishlist on another website). On the other hand, please also tell us the websites you do not like and why? I like the gallery style of the above website, I would like to use the same carousel style for the portfolio listing on my website. I will have around 20 banners/images to use in this list and I want the list to cycle from the beginning once the users reach the end. These questions are meant to grasp an understanding of the audience you are trying to serve on your website. 1. Who is your target audience? Can you group them into socio-economics profiles? As detailed as possible, please describe your visitors in terms of age, occupation, income, lifestyle, educational attainment, etc. If your visitors are mostly B2B customers, please also describe them in term of company size, position in buying unit. Can you build the PERSONAS for your target audience? Normally 3-4 personas will suffice (you may need more specific personas for specific behaviors). Within those, you should have 1 primary persona. 2. What are your customers' pain points? 3. How will they navigate your website (describe the user interaction flow)? A normal flow (sometimes called sales funnels) usually include 3 major steps: show/introduction -> convince/persuade -> call to action (contact, quote, purchase). Each single element and page on your website should be designed and arranged to serve a clearly-defined purpose. Do not confuse a site flow with a user flow and vice versa. Site flow gives you a bird-eye view of your website contents and gives you a general direction of where you can go and how to get there. 4. Can you provide us with your website sitemap? A sitemap (or sitemap) is a list of pages of a website accessible to users and how they should be structured. These questions are meant to understand the content & features you want to have on your website. These content & features should serve the purpose of solving the pain points for your visitors and lead them toward the services & solutions you offer (your goals). 1. What is the content of each entry page? 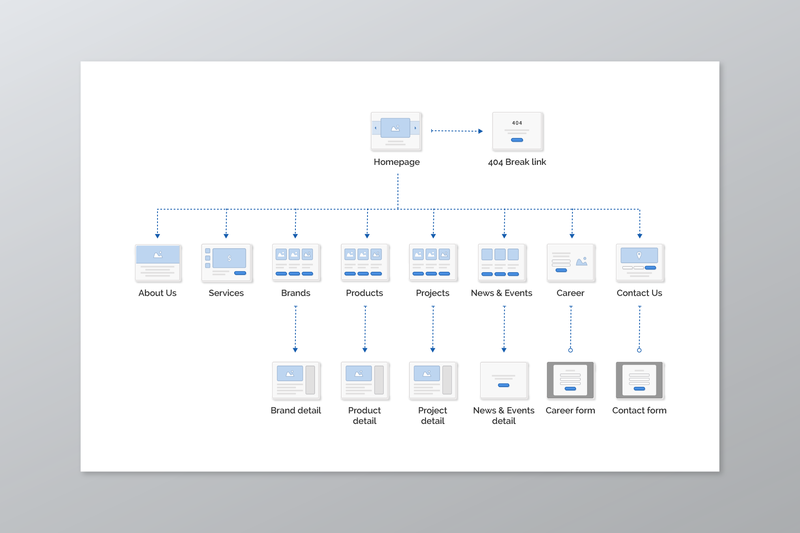 Once you have identified your users’ flows, you should be able to come up with a complete list of “entry points” for your website. These entry points are usually “pages” on your website that the users should go through during their journey on the site. Tell us the content you want to put on each entry point. These content (text, photos, videos, etc…) should serve the purpose of leading your visitors throughout the mapped out user flows to solve their pain points. While it can be near impossible to have all the content ready before the design process, it helps to have as much content and real media as possible so that we can work with real data and information instead of mockup images and fake contents. 2. Can you tell us more information about the content you need? How much of these content can be provided by you? We assume by default that ALL content will be provided by you, we can do minor optimization on the content such as images retouch but we do expect the photos you provide us to be in high quality. If you syndicate content from outside sources such RSS, Social Media feeds, please be very specific about the content sources and how you want them to be syndicated on your new site. Each article should have an author. Each article should have a summary which is used in the article listing page. Article content will be a mix of text, photos, and videos. We would like to also automatically show the Instagram and Twitter latest feeds on our website. 3. Is there anything specific about the content you will provide that we should take note of? At this stage, you should know already who your customers are and the type of content you want to present to them. If you plan to serve customers coming from different countries, perhaps you should plan for a multiple language website. Before jumping to the conclusion, ask yourself if you really have the resources to translate all the content on your website or perhaps you have to fall back to machine translated content using Google translate service for example. 4. How do you plan to manage the content on your website? Once you publish your website you will have to update and manage your content. Who will manage your content? Which exact parts on your website need to be editable/updateable? Is the website management team well versed in term of technologies or they may need support with technical aspects of the site? 5. What features you will need on your site? There are hundreds and hundreds of features that one website may have, which ones do you need? Having more features on your website may confuse your visitors, slow down the website, and increase the development and maintenance cost. At the same time, missing an essential feature may reduce your conversion rate and lead to loss of opportunity. The easiest way to decide which features you need is to look at your customer's' pain points and ask yourself: "which features I need to solve my customers' pain points?". 1. Does your business have brand guidelines that we must follow? What color palette would you like (warm, cold, industrial, black and white, pastel)? Why do you think this color palette represents your business? Is there any specific color that we should avoid at all cost? Which typography style(font) would you like to use? Why do you think this font represent best the essence of your business? We already have our color pallet guidelines, please use this color pallet when you design our website. 2. Is there any specific shape and/or style that you want to use (or avoid)? Do you want us to use Material Design style or any other specific style? Perhaps you want website design to prioritize images, text or balance of both? Do you want a website with a classic structure or something more innovative/outside of the box? Do you want a website with a long scroll structure or one that displays the information in a single section? 3. Do you have other visual reference materials that you would like us to use? There is no need to limit our creativity preferences. If there is any magazine, video, brochure, etc... that you like, please let us know and tell us exactly what you like. Please use our current printed media (brochures and catalogues) as reference. These are technical questions that you can ignore in most cases unless you have very specific requirements. 1. Do you have any specific requirements regarding the language used to develop your website? Do you need your website to be developed in PHP, ASP or perhaps GoLang? Do you prefer to use ReactJS or AngularJS for your web application? 2. Is there any compliance we MUST meet such as the PCI compliance for processing online payments? If there is any industry standards that we must meet, please let us know. If so we will need very detailed technical documents regarding the level of integration you require. 4. Do you have any specific requirements regarding the performance of your website that we should take note of? For example, if you need to serve 10000 concurrent visitors at the same time please do let us know. We would like our website to be able to handle at least 100 visitors at the same time. We also want our website to load quickly no matter where the visitor is (we define quickly to be less than 3 seconds).